Recent conversations with a number of NATA members indicate there may be confusion about the new Safe Sports School Award. Down here in Dallas at NATA Headquarters, we feel it’s important that members – especially those working in the secondary school setting – have the correct information about the award and understand its intent. The brainchild of the Secondary School AT Committee, the award was launched in March 2013. The requirements to receive the award were created using SSATC’s Position Improvement Guide. In the award’s first year, more than 170 awards have been granted. With so many wonderful programs out there and so many ATs working hard to make their school the best, we think it's important to answer common questions. Q. How much is the application fee for the award? A. The cost is $150, and discounts are given to school districts applying for six or more schools (as long as protocols and procedures are universally applied). Q. Why is there a fee? Shouldn’t NATA offer it up free to deserving schools? A. The award comes with a certificate, digital artwork that can be used in a variety of ways and a large banner for the athletic training facility or school gym. It is personalized with the school’s name. Add shipping and staff cost, and there is no “profit” to NATA. The award is not limited to schools with NATA-member ATs. We feel we should recoup the cost. Additionally, there is a sense that people value what they pay for. Q. Is the application fee refundable if we don’t receive the award? A. No, but applicants will know before they submit the application whether or not they qualify. The application is basically a checklist and relies on the honor system that the applicant will truthfully check all the boxes (that, and multiple signatures are required). If a school can’t check all the boxes, they shouldn’t apply. Q. Why do I need a banner to “prove” I’m operating a safe and healthy program at my school? A. Although the athletic trainer is the lynchpin, it’s not just the AT who creates a safe environment. The athletes, parents, coaches and administrators must do their part. 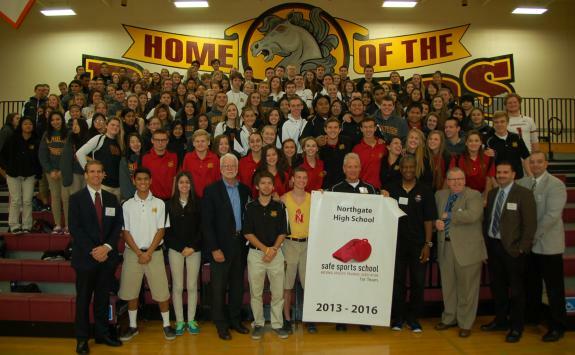 The award recognizes the whole school – and perhaps even the district – not just the AT. Q. How does displaying the award help the profession? A. The award is only one piece of a larger strategy to bring attention to the need for appropriate medical coverage in athletic programs. Due to the media attention on football and concussion, the public has become increasingly aware of the inherent potential for injury in sports. NATA consistently and continuously tells the media there are injuries in sports other than football and other injuries beyond concussion. In other words, it’s not good enough to train coaches to spot signs and symptoms of concussion: They need trained medical professionals on hand. Q. It seems self-serving to apply for an award for myself. How can I explain this to my administration? Besides, if you don’t tell people how great you are – who will? For more information about the Safe Sports School Award and to see a list of recipients, visit http://www.nata.org/safe-sports-school-award or contact Judy Pulice (judyp@nata.org). Take a peek at our Safe Sports School Award album!